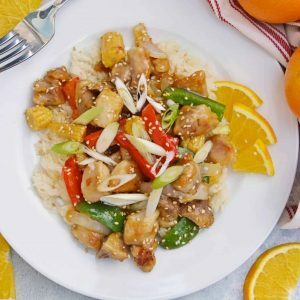 This Orange Chicken Recipe is amped up with bell pepper, baby corn and carrots in a delicious savory orange sauce over rice. Garnish with scallions sesame seeds and orange zest for the best homemade Chinese food. In a medium mixing bowl, combine cut chicken thighs with flour. Toss to coat. Add chicken, shaking off excess flour. Discard remaining flour. Cook for 4-5 minutes, or until pieces are starting to brown. Add bell peppers, onion and baby corn. Continue to cook for 3 minutes, or until vegetables start to soften, but are still crisp. Add Panda Brand™ Sauce for Orange Chicken, tossing to coat all ingredients. Serve over cooked rice. Top with scallions, orange slices and sesame seeds.